Lately I returned Boston MA where I attended HP Tech Con 08. As usually even to get there was an adventure - no seat from Prague to London (but booked seat from London to Boston), delayed flight and missing stand in London and less then 2 hours to connect the flight at ESB powered Heathrow Terminal 5. Roman scared me enough, but finally everything went OK and I safely arrived to Boston on time. Presentations were excellent, I met a lot of interesting people and definitely I will strive to attend the next year again. It was my 3rd time in Boston, I visited Harward and MIT Museum. 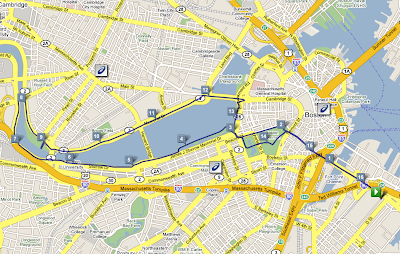 After the conference ended I also did 10 mile workout from the hotel to Charles River. And also I met my ex-Systinet colleague.